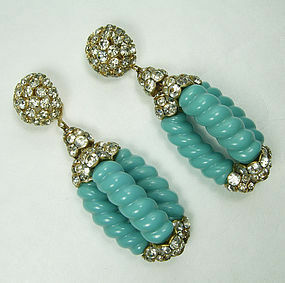 Very unusual beautiful vintage 1960s clip earrings with brilliant rhinestones set in goldtone metal, and turquoise Lucite molded curved elements simulating Persian turquoise. 3 inches long. Excellent condition. Display form is life size. Photos enlarged to show detail.